LED matrix monitors have long been touted as the future of displays. Their advantages over their backlit brethren are numerous. But the major improvements you can expect to see are bolder and brighter colours coupled with more uniform panel consistency compared to CCFL (cold cathode fluorescent lamp) monitors. What's more exciting on the LED front is the prediction that such displays are finally filtering through to affordable models from the likes of NEC and Samsung. Come spring 2008, LED-based panels will be hitting the high street at prices only marginally greater than those of current top-end LCDs. So what's all the fuss about? Existing CCFL lamps are based on mercury vapour in glass tubes that are not as robust as solid-state devices. Although CCFLs do their job admirably - and in the high-end panel market, more than adequately - they're prone to unbalanced brightness. They also have a comparatively short life and are distinctly environmentally unfriendly. LEDs do away with such worries, and so have been quickly adopted by laptop manufacturers such as Apple. These companies are keen to extend battery life in their products (LEDs use far less energy) and prevent cracks appearing when a portable screen gets a whack. 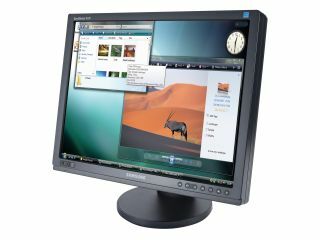 The LED's biggest boon, though, is its colour reproduction, and early example monitors such as NEC's 2180UX-WG display were aimed firmly at graphics professionals - both in their specifications, producing around 110 per cent of the sRGB colour gamut, and in their price. In the case of the two existing commercial models - the aforementioned NEC and Samsung's new SyncMaster XL20 - the road to colour nirvana is reached by placing a strip of LEDs across the top and bottom of the display. This ensures that not only is brightness and colour reproduction of the utmost quality, but uniformity is 100 per cent balanced across the display. Running a DisplayMate test across an LED monitor proves this, with the display evenly illuminated from one edge to the other. There are downsides to LED display technology, not least when it comes to their size. Manufacturers still haven't found a way of housing LED technology in the kind of thin-bezel chassis we're used to on TFT monitors. So the examples we've seen so far are bulbous in comparison to slimline LCD panels. If the likes of Samsung and NEC want to crack the consumer LED market, finding a way to shoehorn their components into a slimmer casing will be imperative. That said, the benefits of LED far outweigh its associated drawbacks. Colour is richer and truer and the screens are far brighter and more uniform. What this presents is a far more impressive viewing experience, with video and games in particular benefiting richly. The consumer market is ripe for an LED revolution, and when the prices of these monitors fall, you can expect to see the end of LCDs.